You must have already tried our free stream availability checker. based on WMSPanel and Nimble Streamer. It makes single check over via all existing checkpoints that are geographically distributed accross the globe. Now, you want to secure your streming and be notified about any outages whenever they happen. 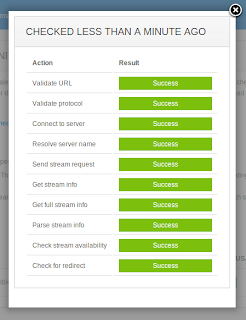 That's what we've made the streams availability monitoring as part of our WMSPanel cloud control service. You sign up in WMSPanel. You set up the email where you want to get alerts to. 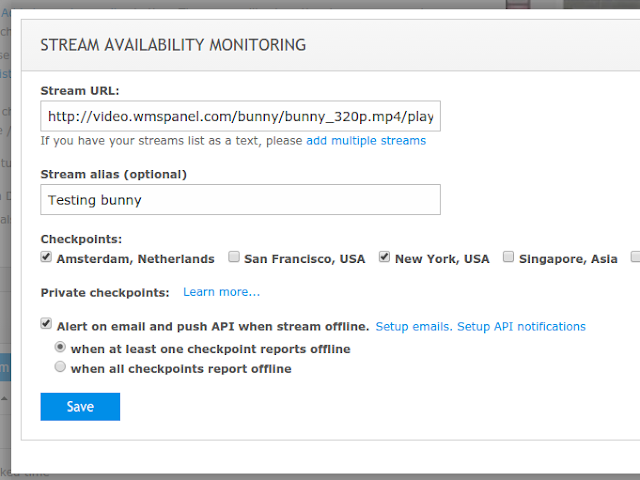 You specify what streams need to be checked from which of the checkpoints. Dispersa monitoring will check each of the streams each 5 minutes. If any of the checkpoints fail to establish streaming connection, it will send alert. Here's the streams monitoring dashboard. You click on "Offline notifications set up" and see this page where you can enter emails and test them. It's also used for server downtime notifications feature. Then click on "Add stream to monitor" in the dashboard to see the following dialog. 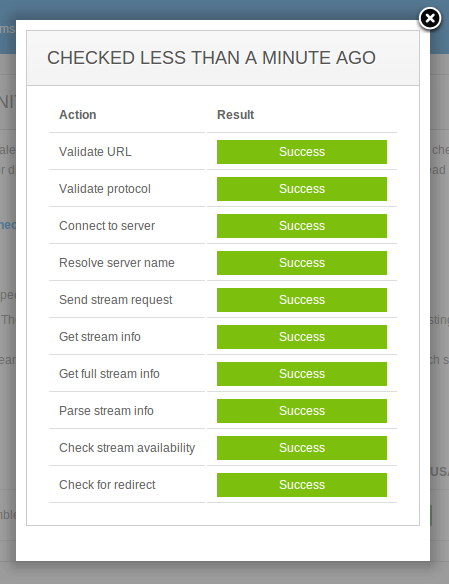 Here you enter stream name and select checkpoints which will test your stream for availability. You may also specify a private checkpoint to be used in protected or closed network environments. In addition you may specify whether Dispersa will notify you on any checkpoint's failure or only when all of them fail to check the stream. Now save changes. You will see the stream added into the table. Right after that Dispersa starts the check over. The result will be show in the table. You may click on the status to see the detailed report. That's it. Enter the streams you want to check and subscribe for our services if you'd like to check them after the trial is over. Each stream has its history of check-overs in streams monitoring history. If you'd like to have same statistics within your monitoring or analytic tools, use Dispersa alerts push API to get notified about streams going offline and online. If you want to control Dispersa streams dynamically, check Dispersa monitoring API. We plan improving this feature set going forward so please let us know of any suggestions or questions.